While spending time visiting some of my friends' blogs, I encounter so many posivite reviews regarding Krispy Kreme products [particularly their doughnuts]. Unfortunately, we do not have this doughnut chain store here in Sweden which is why by the time I've been able to spot a Krispy Kreme restaurant while roaming around the busy blocks of SM North EDSA during my February 2010 visit in the Philippines, I've grabbed the chance to check out what this doughnut shop has to offer. 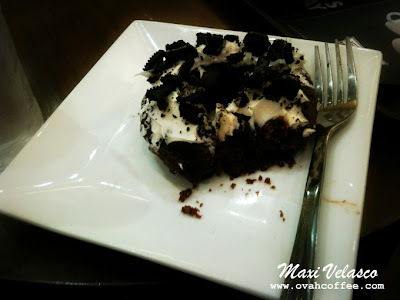 I've ordered a creamy vanilla-iced chocolate ring cake topped with pieces of oreo. This piece costs around Php42 and it does look oh so tempting. When my order's been delivered I've dived in at once and hmmm... first bite = yum [maybe because I was really hungry during that time], second = okey, third = ?? ?, fourth = yayks! I am sorry but my palate isn't fond of the taste. It's too sweet that I've decided not to go for another bite. Maybe next time, if I'll ever visit any Krispy Kreme place again, I might go for something simpler like the store's traditional ring cake [which I hope isn't super sweet] or better yet, I'll just order a cup of hot coffee to unwind and chillax*.